Snapshot: In our heater testing Dimplex have served up some stars and delivered some duds. 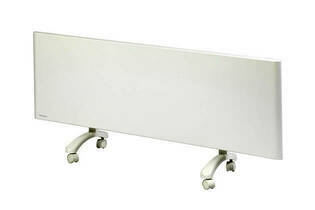 Which category does this panel heater fall into? Good at controlling room temperature. Performance (70%) - calculated on: the heater’s ability to warm a room from 8°C to 13°C and from 8°C to 18°C; the evenness of the room heating; and the thermostat’s performance. Ease of use (30%) - assessed equally on: using the controls, the labelling of controls, the heater’s mobility, cord storage, and ease of cleaning. We test heaters in a special room fitted with 81 evenly placed temperature sensors. The temperature reading from the sensors enables us to create a 3-D map of the effect each heater has. We look at the time the units take to heat the room, the evenness of the room’s temperature, and how well the thermostats keep the room at an even temperature. Tilt test - while all heaters passed the standard’s requirement that they don’t topple over when inclined to 15° in any direction, any portable heater can be knocked over accidentally. So we put each heater on its side with the power on to see how long it took to turn off. Drape test - we turned the heaters up to full temperature on full power and then draped a towel over each heater for 30 minutes. This test should trip the heater’s over-temperature safety switch. "Adding the Dimplex DCU-2T timer to this panel heater is worthwhile"
26 May 2018, David T.
Neat and unobtrusive. With timer can be set to come on and room warm early in the morning. Timer also adds digital thermostat. Timer has to be reset after power outage. Would have been good to have internal battery.